Index investing has seen tremendous growth in recent years as investors increasingly recognize its benefits. Indexing has helped lower costs dramatically while providing easy access to a broad range of asset classes and market segments. About a third of all assets in the U.S. are now invested passively. 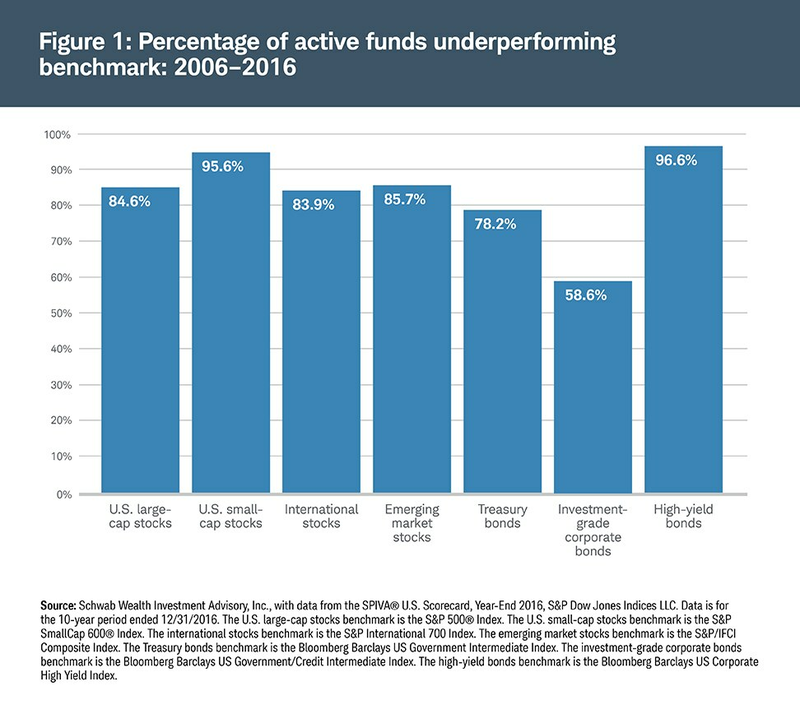 Notably, these criticisms ignore that most actively managed funds have failed to produce even “average” returns, underperforming their benchmark due in part to high fees. As Figure 1 illustrates, the vast majority of actively managed stock and bond funds underperformed their benchmarks over the past 10 years. If indexes were simply driving the entire market up or down, distorting the pricing of individual securities, there wouldn’t be winners and losers. But that is far from the case. With two-thirds of financial assets actively managed, there is plenty of active trading driving the pricing of individual securities. For example, ETFs tracking the S&P 500® Index are among the most widely traded securities in the financial markets, with hundreds of billions of dollars in assets under management and millions of shares changing hands daily. During the week ended August 25, the S&P 500 was relatively flat with a slight gain of 0.7%. But during that same period, two large companies in the index had widely diverging performance. Cisco was up 3.5% for the week, while Costco was down 2.9%. If ETFs tracking the S&P 500 were merely lifting or sinking all boats, these divergences wouldn’t occur. Indexing now encompasses many different structures and strategies. Not all indexes are built based on market capitalization as is the S&P 500. Increasingly, indexes offer exposures to specific slices of the markets, use a variety of construction methodologies, and are being used for tactical asset allocation and other trading strategies. This sort of “active” management using index investments actually enhances market liquidity and helps drive the pricing of securities that makes markets efficient. New “smart beta” indexes such as Fundamental Indexing used in Schwab Intelligent Portfolios seek to enhance a portfolio’s diversification. These indexes are based on fundamental measures of company size such as sales, cash flow and dividends, rather than market capitalization. That difference in construction leads them to perform differently in various market environments than traditional market cap indexes such as the S&P 500. Including a mix of market cap and fundamental indexing can add diversification benefits while keeping costs low. Schwab has long recognized the benefits of indexing, launching the Schwab 1000 Index® in 1991. In following years, Schwab introduced additional index mutual funds and ETFs. And in 2015, Schwab built on this heritage of innovation by launching an automated investing platform, Schwab Intelligent Portfolios, to build and manage diversified portfolios of low-cost ETFs while charging no advisory fee. Far from distorting financial markets, indexing can provide an efficient way to build and manage a diversified investment portfolio at very low cost as you seek to achieve your financial goals. 1. “The Silent Road to Serfdom: Why Passive Investing is Worse Than Marxism,” AB Bernstein, August 2016. The Schwab 1000 Index, made available by Charles Schwab & Co., includes the stocks of the largest 1,000 publicly traded companies in the United States, with size determined by market capitalization (total market value of all shares outstanding). The index is designed to measure the performance of large- and mid-cap U.S. stocks.